Recently I was intrigued by a lantern clock signed Markwick Markham. It was clearly made for export to what we today refer to as the 'Turkish Market', which was then the old Ottoman Empire and included much of the Middle East. The numerals, which we call Turkish but are not Turkish, are unlike those on English clocks, being derived, I am told, from classical Arabic. Certain makers seem to have had good contacts with those regions and to some degree the Turkish Market was monopolised by a handful of London makers, including 'Markwick Markham'. Most Turkish Market clocks are arched dial versions but this clock is of traditional shape and style. This style is very uncommon in Turkish Market clocks and tends to suggest this was one of the earliest made for that market. I know of only two or three Turkish Market clocks of this style, so that was one source of interest for me. Its shape, frame, proportions and construction are those of the traditional lantern clock of the preceding thirty years or so, as there came a point in London lantern clocks where they ceased to develop further. In London the lantern clock was falling from popularity by 1700 other than for those made for export. This clock has the broad chapter ring characteristic of lantern clocks of this period (c.1700), so broad that its rim projects through the top and bottom plates, a feature found in many later lantern clocks. By now the decoration on the dial centre is reduced to a little scrollwork, partly because the wide chapter ring leaves little space between it and the alarm disc, and partly because that space is nearly all taken up by the maker's name. All these are features we expect in later London lantern clocks, but for the Turkish numerals. But also there was confusion, in my mind at least, over the whole combination of signatures on clocks and watches which include the name Markwick, either alone, or with the name Markham. Briefly we knew there existed a James Markwick senior and his son, James junior, but there also occurs 'Markwick Markham', 'Markwick-Markham' and 'Markwick and Markham'. I thought it might be interesting to investigate a little. 1. Lantern clock of traditional shape, which is a very unusual shape for the Middle Eastern market. 'Turkish' numerals, signed 'Markwick Markham'. A striking clock with alarmwork. Verge pendulum outside the backplate. Date about 1730. Click for closer view. James Markwick senior was apprenticed through the Clockmakers' Company in 1656 to Edmund Gilpin, a little-known clockmaker. From those details I had about Gilpin I always had the impression he was a poor man. He was a member of the Leathersellers' Company although his trade was clockmaking - in fact I think only a few watches are so far recorded by him and no clocks. But he joined the company of his profession, the Clockmakers' Company, in 1632 when it was founded, as a Brother and took several apprentices through that Company. A mere Brother had to bind apprentices 'through' a full Member, as it was termed, and most of his were bound 'through' Thomas Taylor, with whom Gilpin seems to have been connected, though I am not sure how. His attendance at the Clockmakers' Company meetings was sporadic, and when in 1646 they made him an Assistant, he absented himself for some years. The post of Assistant involved some expense towards the annual feast or payment of a fine instead, and less well-to-do members would usually try to find an excuse not to be one. In his case Edmund claimed he was away for some years and did not attend again till about 1656, when his Assistantship seems to have been forgotten about - so the ploy, if it was one, had worked. He last attended in 1672. In 1662 Thomas Taylor paid his annual subscription for him, and such an action normally suggests a colleague paying on behalf of someone who could not afford the fee. He was last heard of in the Company archives in 1677, when he was several years in arrears with his subscription, again suggesting poverty. As I began to uncover a few details of James Markwick's life, his connection with Edmund Gilpin seemed intriguing to me. There was obviously some sort of emotional attachment between them over and beyond that of apprentice and master. James named his first child Edmund and one of his later children was called Gilpin as a first name, both obviously named after his former master. Part of the answer came as a result of finding Edmund Gilpin's will, which he signed on the 11th April 1678, and which was proved in 1679. He lived in the parish of St. Stephen Coleman Street and described himself as 'aged and weak in body' - from those dates we have we can guess he was a year or two either side of seventy. I later learned that his wife's maiden name was Jane Milborne (perhaps related to recently-discovered clockmaker of that period Richard Milborne) and that the couple had had several children baptised in the parish church, some of whom died in infancy: Edmund was born 1634 but died young ; Nathaniel was born in 1638 but died in 1651; John was born in 1639 but died in 1640. His two surviving children were (a second) Edmund born in 1635 and Anna born in 1637. It was quite a shock when I read in his will and found that a man I had always thought of as too poor to be able to afford to pay his Clockmakers' Company subscriptions left no less than thirteen house properties, several of which he had only recently built! Edmund junior was Edmund Gilpin's only son, but that son was obviously a wastrel, a type they used to call a 'neer-do-well'. Edmund senior was fully aware of that and left him an annuity of a mere £12.00 a year, and that not to begin to be paid till seven years after the father's death! Edmund would have to earn a few crusts of his own meantime. What was more if Edmund junior tried to contest the will in any way, or 'shall disturb or disrupt my executors', as his will puts it, then the annuity is to be cancelled and he is to get nothing! The reason for cutting off his son was set down in writing to his shame and for all to hear when the will was read out, when the father refers to the son, 'for whom I have paid divers sums of money which he owed'! Edmund had been in the habit of running up bad debts, which his father had ended up paying. Edmund's only other surviving child was his daughter, Anna or Hannah, and here we begin to understand the connection with James Markwick, for he is named in the will as Anna's husband, Edmund Gilpin's son-in-law, and lucky James and his offspring got almost all Edmund's wealth including his many houses. I had been unable to trace James Markwick's marriage, but here in the will was clear evidence that they were married, and, as the story unfolds, it is possible to guess at the reasons I had not been able to trace it. 2. 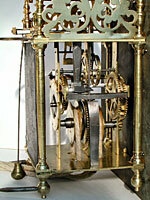 The original verge escapement of the Markwick Markham Turkish market clock. The original alarmwork is tucked neatly inside the backplate. Brass wheel collets. Plain hammer spring and hammer counter. Click for closer view. All was not straightforward with the relationship between James Markwick and Edmund Gilpin. James had been apprenticed to him in 1656, probably aged about fourteen, the usual period being for seven years, during which apprenticeship marriage was strictly forbidden or the apprenticeship fell void. But suddenly in September of 1661, instead of living in his master's house in London, we find James Markwick and his wife living in Croydon, Surrey, where his first child was baptised as Edmund after her father, and where two other children were subsequently born, James in 1662 and Nathaniel in 1664. What could he have been doing in Croydon in 1660 as a half-trained clockmaker? There was no clockmaker, less still no watchmaker, working there at that date that we know of, who could have employed him, and it is very unlikely he could have worked in his own right. It is not until 1666, after six years in the wilderness so to speak, that he was back in London, when in August of that year he took up his freedom of the Clockmakers' Company. From then on he lived in the same parish as Edmund Gilpin (St. Stephens) and quite possibly in one of his houses. Further children were baptised there to James and Hannah, many of whom died young, but those who survived included Thomas born 1677, John perhaps born 1675 and William birth date unknown. I have been unable to trace the marriage of James Markwick to Hannah Gilpin. This is probably because it was in some distant parish, a runaway marriage, in that momentous year of 1660, when, as London rejoiced at Charles II's coronation, eighteen-year-old James Markwick eloped with his master's twenty-three-year-old daughter. Or, if she was already pregnant then, perhaps it was in the year 1661. But you could not do that as an apprentice, run off with the boss's daughter, get married and then calmly come back and take up your Company freedom as if nothing had happened - unless you made peace with your old master and he took you back again. It must have been about this time that young Edmund Gilpin junior had been running up his debts, on the gaming tables or wherever. He was twenty five in 1660, when James and Hannah eloped, thirty-one when they returned, and by now no doubt set in his ways. Edmund senior was sixty, and perhaps glad to heal the wounds separating him from his only other child, who had after all named her firstborn after him! From then on (1666) James Markwick and his father-in-law seem to have been on excellent terms. We may never know where the runaway marriage took place, as runaways deliberately sought a location where they could not be found till after the event - like Gretna Green in later years. There were parishes, which became known as 'lawless' parishes, easy places to get married, where the vicar took your money and did not ask too many questions or require a period of residence, or proof of age, or parental consent for minors. Maybe they married in one such place, of which there were many. But the puzzle was why they then located to Croydon, after having married elsewhere at some still-undiscovered place. And what could they possibly have done to earn a living there or keep a roof over their heads? I cannot imagine James could have worked at the clock or watch trade there, as there was no known clockmaker there and he was in any case unqualified. Was he digging holes in the road? I later found a likely explanation, when I discovered there was at least one Gilpin family living at Croydon in the early 1600s, one John Gilpin, gentleman, who by then (1660) would be around eighty if still alive. Maybe he was Edmund's father - the dates would about fit. So the runaway daughter and husband perhaps found refuge with her grandfather, or perhaps an uncle or aunt, who might be less likely to turn them out into the street than an angry father. Six years later, the rift was healed and they were back in London, where James pursued his career. 3. 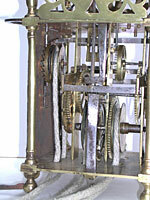 This square dial lantern clock of the 1690s is by James Markwick (I) and has its original verge escapement. Click for closer view. In 1673 James Markwick succeeded 'Mr. Samuel Betts deceased at the Back of Royal Exchange'. Samuel Betts was a clockmaker, who seems to have made principally watches, strictly-speaking a member of the Blacksmiths' Company, though he attended Clockmakers' Company meetings as if by a natural right, even though he was never a member. In 1677 James Markwick was fined for abusing the Master at the Clockmakers' Company's Stewards' Feast, of which he was himself a Steward. By now he was no doubt prospering in the clockmaking business, as well as having financial backing from his father-in-law. In 1679 Gilpin senior died and left almost everything to James, including bequests to some of James's children (Edmund's grandchildren). James was now a man of substance, and in 1686 he refused to pay a fine for failing to attend the Clockmakers' Company court meeting, leaving 'in a abrupt and angry manner'. After this he hardly ever attended meetings and by 1699 he ceased to attend at all. Perhaps his wealth had given him independence from conformity. James Markwick lived on till 1716, when he died a very wealthy man, fortunately leaving us his will for further enlightenment as to how workmen became masters, who then became wealthy, who then became gentry. His bequests included an agreement dated 1704 to rent an estate in the manor of Pevensey, Sussex, from the Crown for fourteen years from 1720. He explains in his will how he has already provided for his older children 'having above twenty years since given my shop and the best part of my trade to my eldest son, James Markwick, for his better advancing himself in marriage'. 'My son, Nathaniel Markwick having stood me in very considerable sumes of money in his education' (Nathaniel entered the clergy and became vicar of East Brent), 'and my son, John Markwick very considerable in the setting him up in the world, and also my son, Gilpin Markwick, having had very considerable sumes of money for his advancement' (Gilpin Markwick later became Keeper of the Prison at Clerkenwell, a post which I believe was purchased at that time) ...' and in regard I have not yet provided for my son, William Markwick, as much as the others, therefore I give him one full third part of all my estate'. He refers to him as William Markwick of Bexhill, Sussex, Gentleman' and gives him the lease of the estate he had from the Crown. The Markwicks moved from runaway apprentice to workman to gentry in one generation! James Markwick Junior was freed in the Clockmakers' Company in 1692, aged thirty, 'by patrimony', that is by virtue of his father's existing freedom. He was married in 1696 to Catherine Carleton and it was about that time that James Senior must have given him 'my shop and the best part of my trade', which meant in effect that James Junior ran the business from that time. Only three of his eleven or more children seem to have survived. When he wrote his will in 1729, he divided his property into three parts, which was the custom in London. The first third he gave to his wife. The remaining two thirds he gave equally between his son, Thomas, who was a 'Citizen and Grocer' (meaning a member of the Grocers' Company), his son-in-law, Robert Markham, 'Citizen and Currier' (a member of the Curriers' Company), and his unmarried daughter, Elizabeth aged about twenty two. He mentioned that 'whereas in my lifetime I gave my son, Thomas, £1,000.00, and to my son-in-law, Robert Markham, £1,000.00 on his marriage to my daughter, Catherine', each of those earlier gifts is to be regarded as their appropriate share. As a codicil he left his brother, Nathaniel, vicar of East Brent, ten guineas for mourning. 4. The square dial lantern movement from the right. Click for closer view. Robert Markham was the son of Richard Markham, who came from Buckinghamshire, was a member of the Curriers' Company in London from 1666 and died in 1715 leaving everything to his wife and only son, Robert. His bequests included plate and jewels but also any moneys owing from the government or any 'body politick', which implies he had trade with government departments. Robert was probably born about 1680 and was made free of the Curriers in 1700 after having served an apprenticeship. He appears to have been about twenty years older than his wife, Catherine Markwick. Robert Markham died in 1741, leaving bequests in his will to his wife, Catherine, his only son, James, and two unmarried daughters Elizabeth and Anne. These included household goods, 'plate and jewells', but also considerable stocks in Old South Sea Annuities and Million Bank stock. MARKWICK, MARKHAM, STORY - to about 1780.